People have been immigrating to America for centuries and for many reasons. The Pilgrims in the early 1600s sought religious freedom and hundreds of thousands of African slaves came against their will. Many people have come for a better life and economic opportunities. The process whereby a foreign citizen or national can become a U.S. citizen now is called “naturalization.” Before engaging in the naturalization process you have to be eligible to apply for naturalization. This is a legal process with a number of stages part of which involves fingerprinting sometimes called biometrics. Read on to learn about who is eligible to apply, what the application process is and how fingerprinting is part of the process. To apply for naturalization, you must not already be a U.S. citizen. Strange as it may seem, some people may consider applying for naturalization as a U.S. citizen when they already have citizenship. This may be because unknown to them, they were born abroad to a U.S. citizen or they may be the child of a person who has become a U.S. citizen through naturalization. In the case that you are already a U.S. citizen, you may look into obtaining a Certificate of Citizenship rather than immigrating to America. Immigrating to America – Who Is Eligible? Not everybody is eligible to apply for naturalization as a U.S. citizen. The U.S. Citizenship and Immigration Service (ASCIS) provides a Naturalization Eligibility Worksheet to help people interested in immigrating to America to understand if they are eligible. There are other criteria which you also have to meet which are listed on the Naturalization Eligibility Worksheet. There are exceptions you may need to study. An immigration attorney can help you through the criteria, application, and process. To apply for naturalization as a U.S. citizen you must complete Form N-400, Application for Naturalization. There is also a fee that must be submitted at this stage. Part of the application process involves being fingerprinted. You may go to any Fingerprinting Express location to obtain your two FD258 fingerprint cards. You must have a valid government-issued photo ID in order to be fingerprinted. International ID’s and Passports are accepted as long as they are valid and contain your identifiable information. After you are fingerprinted, you will have to mail in the fingerprint cards. It can take 3-6 months for the results. Your fingerprints will be scanned against the FBI’s Criminal Database and the reports generated will present insight to any Criminal History. Make sure your application and checklists are complete before submitting. This is done so that the Federal Bureau of Investigation (FBI) can carry out background checks on you. You will be invited for an interview at a local office at a specified time. You will be asked some questions about your application and about your history. There are a couple of tests which you will need to pass. There is a simple English reading and writing test. You will also need to be able to sign your name in English. These literacy tests are not required if you are not able to read or write due to a disability or if you have been a permanent resident in the U.S. for at least 50 years. The other test is the Citizenship Test. If you are successful in your application, you will receive a ceremony date. This process is long and can be frustrating. Taking the Oath of Allegiance will complete this process. Celebrate your hard work and perseverance in becoming a United States Citizen and soak up this special moment. The process of immigration to America is concluded with a ceremony at which you take the oath of allegiance. So that is the process for immigration to America and applying for U.S. citizenship. Part of this process involves the use of fingerprinting. Just about everyone in America will need fingerprinting at some point for education, employment, volunteering or legal needs. To learn more about fingerprinting services, click here. We are here to help you on your journey to naturalization in the U.S. Visit any Fingerprinting Express location in Nevada to obtain your two FD258 fingerprint cards today! 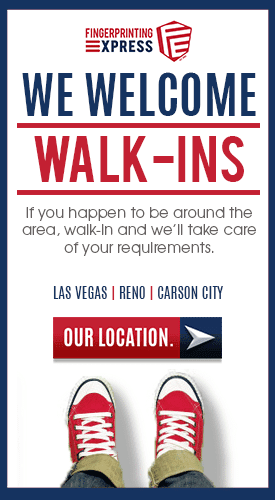 We offer fast fingerprinting services in Nevada, no appointment necessary. WHAT DO YOUR FINGERPRINTS SAY ABOUT YOUR PERSONALITY?